health.knet.ca - Keewaytinook Okimakanak Health Services coordinates delivery of community-based projects and administers regional health programming and services. Health Services are headed by a Health Director, who works in collaboration with a KO Health Advisory Committee. The Advisory Committee and the Director report to the KO Executive Director and ultimately, the Keewaytinook Chiefs. Several health programs and initiatives are presently being coordinated by Keewaytinook Okimakanak Health Services staff, in particular the KO Telemedicine Initiative is now in full operation. 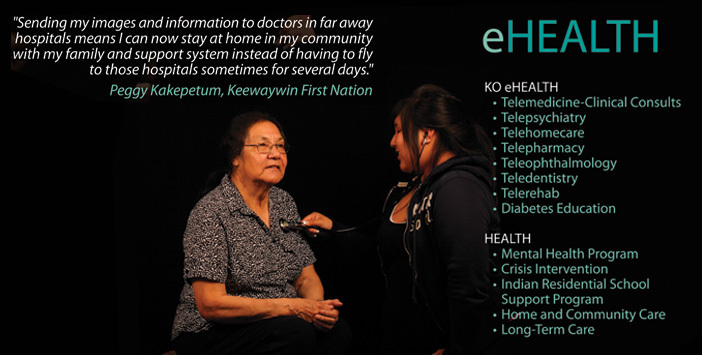 telemedicine.knet.ca - KO Telemedicine will improve health for all First Nations Communities through a sustainable First Nations Telemedicine Program that is holistic, community driven and culturally appropriate. KO Telemedicine (KOTM) delivers clinical, educational and administrative services via videoconferencing and advanced information communication technologies to First Nation communities in Ontario.